Teaching is full of incredible possibilities and yet there is an everpresent ticking clock that drives our days. Lack of time can feel daunting and can stifle innovation for teachers since there is always so much to do. Carefully assigned blocks of time can help support teaching and learning in different subject areas, but they can also be confining. In the past few years, I have been able to meet extensive Ontario Curriculum expectations by creating and implementing projects that build outside of those blocks of allocated teaching time. These projects are also sparking a level of engagement that surpasses any more traditional form of project that I have given. I have come to refer to these projects as Building Outside the Blocks or, more simply, BOBs. Building Outside the Blocks is an approach to teaching and learning that not only benefits all the students in a classroom and invites them into their learning, but it helps teachers achieve learning outcomes in twenty minutes (or less) of class time a week. BOBs are formative assessment strategies that help meet many expectations while concurrently contributing to community building inside the classroom. BOBs are teacher-provided and student-driven. They are a way for students to bring a piece of themselves to a school assignment by allowing them to have a voice and choice. Here’s how it works. The teacher provides the project that addresses several curriculum expectations in English or Science or Social Studies, but only a few students present each week and the entire project takes place over a few months. The students choose their due dates within a scope of provided dates and then they think through how to present the project. At the same time as any content area learning expectation is being addressed, oral communication and some form of literacy skills can be practised. Because BOBs are presented weekly over a period of time, students really look forward to them as part of the fabric of their school week. After each student presents a BOB, the presenter elicits feedback from their classmates who act as coaches to suggest next steps or provide positive feedback—simultaneously, students are standing in front of their classmates, and classmates are helping each other learn. The process helps to encourage excellence by having students set the bar for each other and by making their projects seem attainable. The class provides feedback on the presentation in regard to content or delivery—body language, stance, volume, pace and engagement with the audience. The role of the class in providing feedback also allows students to process and share an understanding of the success criteria for each BOB. If they don’t fully get it the first week, they will have other opportunities to solidify their sense of the assignment before they have to present. To better illustrate the experience of a BOB, I will give you an example. 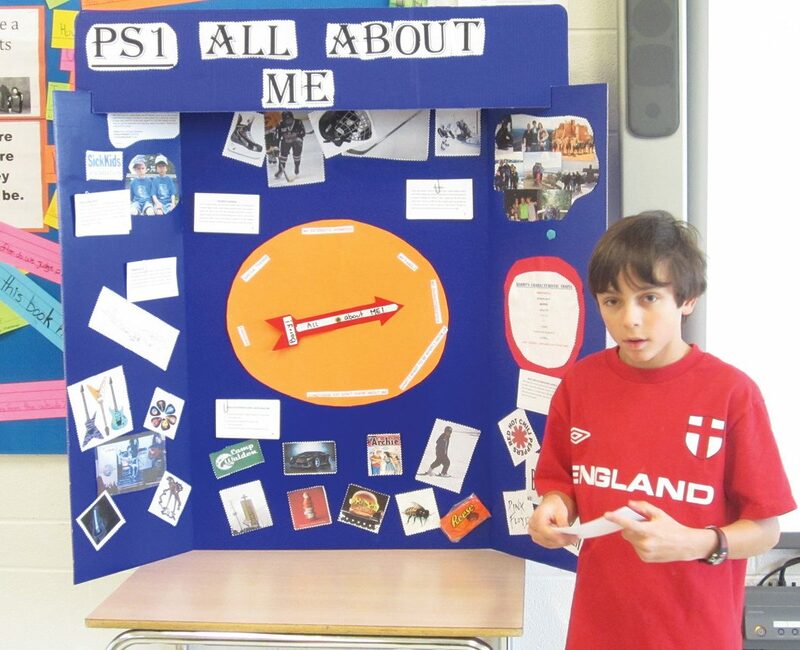 The “PS1”—a Portrait of yourSelf—is my first assignment in Grade 7 Language Arts each year. Students are asked to introduce themselves to the class. Interestingly, these types of projects decline as students get older, though they are even more essential during major stages of identity development such as in Grade 7. The response from the PS1 is always incredible. Students who have been in a class together since preschool are not only learning new things about each other, they are engaged with each other in new ways. The PS1s change how my students interact with each other in my classroom and in the hallways. I have pages of feedback from students who were blown away and grateful for the PS1s—they were appreciative of the chance to both discover and share who they are with the class. 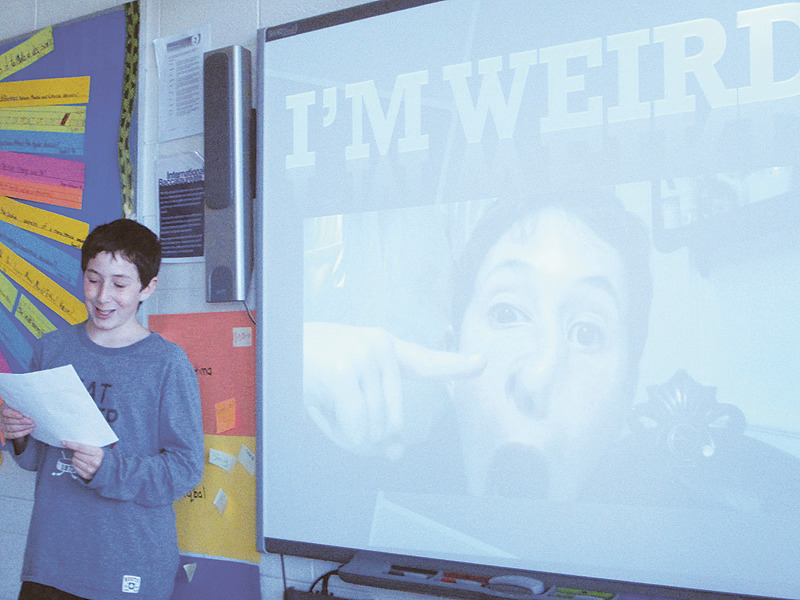 I have a self-professed wallflower this year who shared a video of her PS1 to show the class her world (and avoid presenting live). We had never seen her so animated or heard her so clearly (she is very quiet). The class learned about her love of horses and her dreams to open up her own riding school. Her smile deepened as she took feedback from the class (live) who were joyful to know so much about her as she had never really let anyone in before. As a result of the PS1, she interacted with more of her classmates in small discussions and in the hallways than before. This one BOB assignment helped students meet themselves, each other and over twenty outcomes in oral communication, writing and media literacy expectations in minimal class time. The purpose of a BOB is to create an avenue for authentic learning and growing that extends beyond the unit of study or inquiry. While the teacher provides an outline, the exact content of a BOB is the choice of the student. With a PS1, for example, the outline requires students to share information about their character traits, family and interests/hobbies, but the students can decide what additional information they want to give. As well, it is up to them to determine how they will share those elements with the class. Many of my students show family pictures or snapshots that reflect certain character traits, but that is where the commonalities end. Students have chosen to show off their skills with footage of them playing piano, basketball or water skiing. Some students played guitar in front of the class or wrote and performed a song to a familiar tune that incorporated all the requirements of the project through original biographical lyrics. Other students created something visual using materials of interest including a Lego sculpture, a video game, a poster, a collaged skateboard, a hockey stick-timeline, a video interview with themselves, and an iMovie of animation they created. The PS1 is a kickoff to a year that follows with a PS2 and a PS3. The second is a PS2 which stands for Personal Soundtrack and the PS3 which is called Photo Synthesis. The PS series are my BOBs for grade 7 English/Language Arts. While the content differs, each one has a personal aspect and uses the different projects to highlight unique parts of each student. The PS series got its name because, though I am not a gamer, I like to use the students’ vernacular for cache. By the end of the year, the students ask for a PS4 to start grade 8. “Master Storyteller” (MST) is a BOB that, like the PS1, can work equally well in upper elementary, middle or even high schools. Each student chooses a storybook to read to the class. It provides the teacher with a great baseline for decoding and reading fluency, but it also gives students opportunities to develop their skills over time. Master Storyteller is a tri-BOB— a BOB that recurs and spirals with complexity of task and product. In the first MST, students read their stories to their class. In MST2, they tell a story and incorporate visuals. For MST3, they write and present their own original stories using visuals. You can track the development of the students’ reading skills while challenging them to develop their presentations and writing skills over the course of the year. Each spiral of MST was presented over a three month period. The BOBs can last and engage students all year long. What makes Master Storyteller so powerful is the connection this particular BOB can bring between the student and the class. In one Master Storyteller cycle, one of my less receptive hockey player students came alive. He presented a really challenging hockey narrative on a famous goal in Canadian history called The Greatest Goal by Mike Leonetti. He would have never selected a picture book as difficult as that had he not been driven by the content. His personal connection to the story propelled him to his highest level of engagement and achievement in reading fluency that I had witnessed to date, showing a deep comprehension and a strong sense of accomplishment. As a result, this student was more of a partner in his learning and willing to discuss and take ownership of his learning goals. Teachers have long known the difference between students’ responses when they’re engaged through their interests. When you involve students with their learning and help them grow from their strengths, you see them transform in front of your eyes. BOBs cater to the individual by allowing the student to choose something meaningful to them outside the units of teaching and outside of class time. There is no class time allocated for preparing a BOB. Students work on their BOBs on their own time with a view to their selected presentation date. These projects matter to the students, and they proudly share their time investments like badges of honour. Some students work on their projects for many hours. Their motivation is not for the marks or even for fanfare, but to polish these pieces of themselves for all the class to see. One of the things that makes a tri-BOB so effective is the students have three chances to present over the course of a school year, and they can see their growth, their connection to themselves and their learning while improving their efficacy. They aren’t bored by these recurring projects because they differ each time. The only common thread, as with every BOB project, is that they have to present something to the class on a date that they select from the teacher-given options. Tri-BOBs can be great, but so can one-off BOBs. I know this because, as it turns out, I had been doing this my entire teaching career without being aware that I was developing an approach or that this was something valuable enough to share. I have been sharing some of my BOBs with colleagues who have also found the projects impactful. They agree that the power of a BOB is not just the project itself, but what it can do for the individual learner and for the class as a whole. BOBs build autonomy, community, connection and skill. When reflecting on my almost twenty years in teaching, I see that I’ve always been building outside the blocks. I am strongly encouraging other teachers to explore them and share ideas. The way to create a BOB is to highlight something that you want to backwards design from the adult world; a genuine skill students will need regardless of their chosen career paths, like storytelling or media literacy. Then, use the students’ lives and interests as the conduit. The project should be general enough that it can be individualized through student choice. BOBs can help your students see themselves and improve their skill sets without having to meet short-term deadlines. Students can watch other presentations, formulating their own unique approaches so that by the date they have selected to present, they are clear on the expectations and ready to deliver. With the focus on learning rather than teaching, Building Outside the Blocks is a far-reaching approach that is worth trying. I hope this helps to give you another option. When you can’t find a way to meet expectations inside the blocks of teaching time, build outside of them. That could make all the difference. To learn more about BOBs, visit https://buildingoutsidetheblocks.com/. Noa is a passionate educator who wants to help invigorate teachers with effective strategies and teaching tools. She is presently a middle school teacher, the Student Council Advisor and the RS360 Coordinator at The Leo Baeck Day School in Thornhill, ON. Noa holds a Masters degree from the Ontario Institute for Studies in Education at the University of Toronto. She has been a classroom teacher and a leadership development consultant, presenting on Building a Leadership Culture at the ISAO Best Practices Conference and other professional development days. Noa has led many family and teacher workshops and develops school-wide initiatives that become embedded in school culture. She has had two children’s books published under her maiden name, but writes most often for her students and her daughters.